Most pundits have had a hard time wrapping their mind around the video as a wise—or even intentional—campaign move. Politico’s Roger Simon tweeted that the video could be real, a hoax, or a staff joke accidentally made public. The Washington Post’s Aaron Blake compared it to the surreal YouTube stylings of Mike Gravel in 2007. Indeed, between the slurring, haggard, smoking chief of staff Mark Block, the disjointed editing, the Americana techno music, and the sly, slow grin from Cain at the end, it’s easy to wonder what exactly Block was thinking (and smoking). But in fact, Block knows exactly what he’s doing. 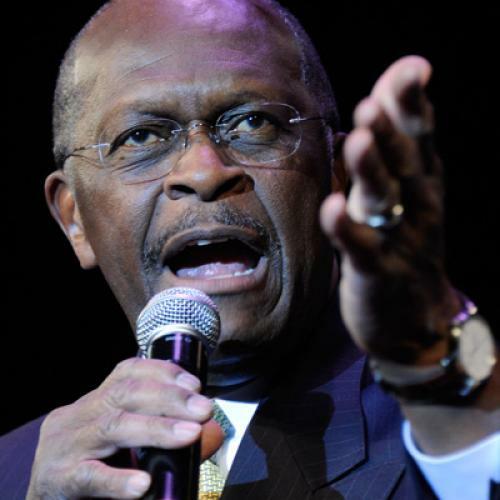 Herman Cain’s continued goofiness is all part of the plan. If you’ve seen Herman Cain sing “Imagine There’s No Pizza” back in 1991, you know that goofy, Dad-style humor is an inherent part of his personality, not just a campaign gimmick. And his campaign is right to let that humor shine, as it effectively projects an authenticity that his rivals could probably never achieve. When Mitt Romney asked some African-American teenagers “who let the dogs out?”, it’s a safe bet the world was laughing at him, not with him. Watching Cain on YouTube and on television, I sense he actually understands that sometimes he’s the joke. And that sometimes the entire campaign process can be a joke. It’s thus endearing that Cain is willing to laugh along with us. Many politicians work hard to pretend that they don’t take themselves too seriously. Cain doesn’t have to pretend at all. Of course, Cain’s goofiness can also alienate, leaving voters and pundits to wonder whether he’s serious about the race at all. Intense scrutiny of his 9-9-9 plan, as well as flack for apparent flip-flops on abortion, gay marriage, and Guantanamo prisoners show that Cain can’t coast by on humor alone. And some of his “jokes,” like the one about the electrified Mexican border fence, can seem more like policy gaffes than lighthearted politicking. But to the extent that Cain’s conservative base is skeptical of the media, mainstream derision of the candidate’s humor could make his supporters even more loyal. Cain’s silly videos could thus be analogous to the song “Miracles” by Insane Clown Posse. Although that video was widely mocked on the Internet and parodied on “Saturday Night Live,” rapper Violent J said the target audience was not the world but the Juggalos—hard-core fans of the band that “don’t give a [lot of thought to public opinion].” Like “Miracles,” Mark Block’s latest video has many more dislikes than likes on YouTube. And like Violent J, Block may not care. Herman Cain’s campaign has little reason to change its strategy as long as polls show a plurality of Republicans prefer the pizza candidate with extra cheese. James Kotecki is a writer and video blogger. The Economist called him “probably the world’s foremost expert on YouTube videos posted by presidential candidates.” He is on Twitter.